What would drive Sierra Montgomery to board a dilapidated airplane in a blinding snowstorm and parachute onto a partially frozen lake knowing if the plane didn't crash from the weather, she would most likely die in the icy waters? Paul Bronson is about to find out. His family has housed defectors ever since General Reginald Rawlings ousted the monarchy in the neighboring country thirty years prior. The latest plane load of refugees brings a beautiful young lady with a bounty on her head and a claim on Paul's heart. The struggle to keep her safe and out of the enemy's hands will be the toughest thing Paul has ever done, for one cannot defy Gen. Rawlings and come out unscathed. Sierra is the last Montgomery, a once powerful royal family whose members had been terminated. Scars of Defiance tells her struggle to defy the present dictator, Reginald Rawlings, and his son, Victor, who she’s been arranged to marry. Along the way she finds allies and love to make it through this terrible tragedy. Scars of Defiance is a truly enjoyable read. This novel isn’t just light romance, but has an undercurrent of politics and action. Before your eyes start glazing over with boredom, the politics in this story isn’t complex or a giant snooze-fest. The government system is easily explained throughout the story and doesn’t take the focus away from the main plot. Sierra is a character of strength and courage and her perfect match, Paul, complimented her with his bravery and loyalty. They were written as ages 18 and 19, respectively, but I couldn’t quite remember that they were supposed to be that old. They just had such innocent personalities, even with their upbringing and lifestyles. If they didn’t talk about mature subjects like college or marriage like it was right around the corner, then I would’ve pegged them as younger characters. 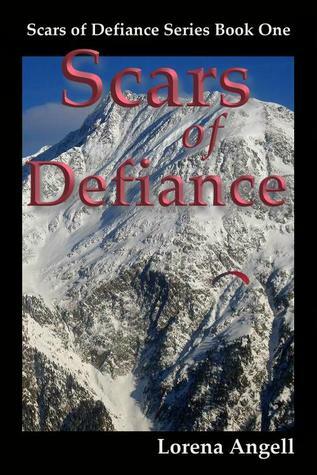 I would recommend Scars of Defiance to anyone who wants a light romance with twists and turns throughout. Thanks for your feedback Chris! I'm glad you're a fan of Lorena's and hope you enjoy Scars of Defiance! !